Napoleon Hill wrote his book “Think and Grow Rich” almost 100 years ago (1937) and his principles are still as valid today as they were back then. It is one of the best books ever written and if you want to be successful in life, this is THE ONE to read! This book was written during a period of 20-years (before internet and cheap flights etc…. ), whilst Napoleon was researching and interviewing 500 of the most successful people in the world. The likes of: Thomas Edison, Henry Ford, Charles M. Schwab, Andrew Carnegie etc. Andrew Carnegie was the inspirational source behind the idea but unfortunately he did not live to see the finished work of Napoleons great efforts. The subconscious mind is helping us store and retrieve data based on our internal “program” which in turn is based on all our thoughts and everything we experience. Some parts of this information will become more ingrained than others. 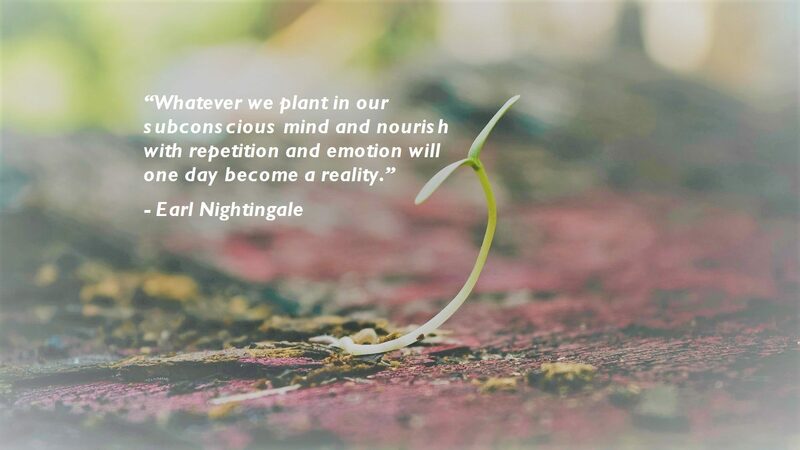 In this respect, Hill is very clear about the importance of our thoughts as you can (and most likely will) decide what you plant and nurture in your mind. This is one of the reasons Hill is so focused on his Principle 1: Burning Desire and the statement he wants you to write down, memorize and constantly read to yourself. If you hold that clear vision of yours in your mind and attach all possible feelings and emotions to it and you do this as often as you can (ideally morning and evening) you will imprint it in your subconscious mind. The effects of this is that your subconscious mind is starting to work for you and help you achieve those goals of yours as your subconscious now knows that these goals are of outmost importance to you. You will have a more open mind and see and notice things working in favor of your goal. Things which might have been there all the time but you didn’t notice them as your subconscious mind was not aware of the importance to you (since it was occupied with other thoughts you had ingrained!). Hill also talks about the importance of systematically trigger your subconscious mind (via autosuggestion). Time means absolutely nothing to your subconscious mind so you have to be very diligent and make sure that you repeat your goals as often as you possibly can. All those thoughts should have positive emotions attached to them as this will make them real much faster! Combining this with some of the other principles from Hill is instrumental to make changes in your subconscious mind as fast as possible and with the greatest possible impact. I recommend you to read the ones on: Autosuggestion, Faith and Persistence. Your subconscious mind does not reason, it doesn’t analyze nor think. It just does what it has been trained to do by its master, YOU and ME! If I plant a lot of weeds in my garden I will get loads of weeds but if I plant loads of organic vegetables, guess what, I will get loads of great organic vegetables! It won’t judge or help you if you didn’t want weeds, you just reap what you sow. I would hope this example clearly demonstrates the importance of thinking correctly and planting the right, positive thoughts and not loads of rubbish negative talks! All of our thoughts and actions have been stored and memorized in a way that allows this “system” to help us remain within our comfort zone. I see several challenges with this as you might guess. If we “let” this happen to us and we don’t sow the right seeds in our minds not only will we get garbage but that garbage will make things even worse and reinforce what has happened and give us more of that (negative thinking most likely)! If you just want comfort, that “space” will eventually make your world of possibilities smaller and smaller as your comfort zone will increase and all you end up doing is strengthening your old beliefs and patterns. This is devastating to your future! Show WHO is boss by planting the right seeds and use the tools and techniques on this site to help you do just that. When you do, you will have an autopilot (your subconscious mind) working for you, helping you 24/7 achieving anything you want! I have implemented lots of different techniques and strategies to make sure I nurture my mind in a forceful and invigorating way. I want result fast and I know you want the same and that is why I love attacking a problem heads on and from as many angles as possible. I want to immerse myself and my brain in to positive emotional thinking and continuously reinforcing that pattern to make sure it work for me all the time. Don’t you love the fact that if you make certain changes once, implement them strategically and habitually, they will become your personality. You are the sum total of your thoughts (thank you for the insight Earl Nightingale)! As soon as you feel a comfort zone that you are reluctant to move outside, you have to! If we stop growing, we stop living and without growth we start to die from the inside and if you let that happen to you, you will NEVER become successful! Brainwash yourself it works wonder and I use this every day! Create a winning Mindset – it will serve you for the rest of you life and here is how to! Personal Affirmations to benefit you – download my free e-book!